I think we are three or four episodes into the new season of the Biggest Loser and so far I am really enjoying it. This year we again have three trainers, Dolvett Quince, Jillian Michaels, and Bob Harper and a new format and rules as well as a much shorter episode every week. I will dive in with my views, but they matter a lot less then everyones views overall as the show will only succeed with big ratings. This is a big one. I have complained for years that they were dragging things out and making us watch long workouts with no knowledge gain for the viewer and this year with a one hour episode I think the show moves along a lot better with a lot more punch to the segments and no dragging out the “Last Chance Workout”. Lets face it, for a crazy show like the Biggest Loser where the goal is to lose 100 pounds or more in a very short period of time it really has to come down to the trainers and their methods and the way they either train or motivate and we are getting to see a lot of that. Just the idea that each trainer was allowed a save of one player was a big step. I am also liking the fact the the trainers are really getting into the heads of their team and explaining why instead of trying to build up the drama of someone always failing and having to be picked up. I’m not sure but it seems like the people this season are not as big as in past seasons except for a notable singer, Ruben Studdard, so all of the people have a background but it is more about their battle than their terrible past. I like seeing people work really hard against adversity but the last few seasons it seemed like the show was going deeper and deeper to try and find people that were just about to die and bring them on. I know that helps the ratings but it is harder for most of the audience to relate to. On a slightly different note, I have loved that the teams seem to be getting along quite well this year and they are really working well together. No threats to quit in mass like last year, no whining and complaining about teammates, although I am sure gameplay will start coming quickly enough anyway. So what are your thoughts? Have you been watching the show? 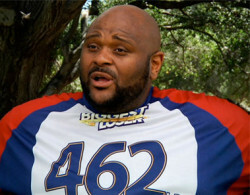 Do you like or dislike the way the Biggest Loser is going? I am excited to watch the rest of the season this fall and winter for sure!